The fish pond pump articles provides guidance and review about different types, qualities, durabilities, and prices. This pump is used for the water circulating in the fish pond. A fish pond is a small artificial water reservoir built for the fish farming. A fish pond is used in the farming of fishes for our home needs, growing ornamental fishes for the decorative purposes and aquaculture. Most of the fishes we keep in our homes in small fish tanks and aquariums are raised in the fish ponds. Fish pond pumps are mostly submersible pumps where the pump is kept under the water level. The pump and the motor are kept in a sealed container to avoid the water infiltration. And they are powered by the external power source mostly electrical power via the power cords. Fish pond pump helps in the circulation of water in the fish ponds. They create a lively atmosphere by maintaining the oxygen levels in the pond, avoids the water stagnation and their related problems. Fish pond pumps also help in keeping the fishes healthy. They remove the drains and waste substances mixed in the fish pond. Now, let us look at the various specifications and the factors to be considered while selecting a fish tank. A proper pump helps in the effective water circulation, creating healthier waterscape for the fishes and minimum power consumption. 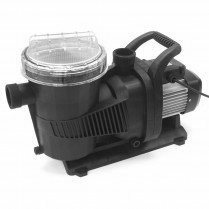 Type of pump – We must choose whether the pump is an external pump or a submersible pump. External pumps have a high capacity but are noisy in operation. Submersible ones are quiet in operation and are cheap. Submersible pumps are preferred for the smaller ponds and the external pump is suited for the larger ponds. Flow rate – The amount of water need to be circulated in the fish pond. First, we have to find the total capacity of the fish pond and determine the amount of the water present in the pond. It is expressed in terms of the volume per unit time as liters per hour or Gallons per minute (GPM). Usually, half the total volume of the pond is used as the flow rate. For a pond of 1000 Gallons capacity, the maximum flow rate is 500 Gallons per minute (GPM). Head – the head is the maximum distance a pump can push the water. We have to consider how high the water is to be pushed by the pump, how far to move the water, no. of joints, elbows, and T-joints in the pipelines. And the maximum head is the point or the distance at which flow rate becomes zero. Fish load – It is the amount or load of fish per gallon of the water. More the amount of the fishes more will be the circulation of the water required. More the fish load, more the flow rate is required. It is advised to maintain a standard of five fishes in length of five inches in a pond of one gallon of volume. Avoid the fish crowding for maintaining a proper fish pond atmosphere. Filters – It is essential to choose a proper infiltration system to drain the wastes accumulating and maintain a clean environment in the pond. The filter must not affect the flow rate of the pump. If the flow rate is more than the amount of water that flows through the filter, the water may not be filtered and cause damage to the filters. Filters help in removing the algae and bacterial growth in the water and maintain the oxygen levels in the water. Power - we have to consider the power requirement of the pump. And the voltage range of the electrical power source is in the range of 110V or 230V. We have to choose to most efficient pump to achieve lesser operation cost and efficient pond conditions. Now let us go into the manufacturers, price, capacity, etc. of the pumps that are available in the market. The main manufacturers of the water pond pumps are All pond solutions Inc., Aquascape Pumps, Alpine Pumps and Pond Master pumps. Their prices vary from 30$ to 200$ depending on their capacity, flow rate, operating conditions. Most of these pumps are used only in aquaculture only. They can be bought from websites such as AZpumps.com, Amazon.com, ebay.com, Wal-Mart etc. All pond solutions Inc. is one of the retail providers of the pumps. They make all the products used in the pond aquaculture such as the filters, tanks, skimmers and many pond products. They have pumps from flow rates of 2000GPH to 16000GPH. Pond Master Pumps make the high capacity pumps that are used in the large ponds. They are continuous duty submersible type pumps. They are submerged inside a polypropylene enclosure to avoid the water infiltration inside the pump. Alpine pumps are usually oil-free, magnetic driven pumps. They have a filter to prevent the clogging of water in the pumps. And they are highly efficient pumps due to their magnetic drive application.